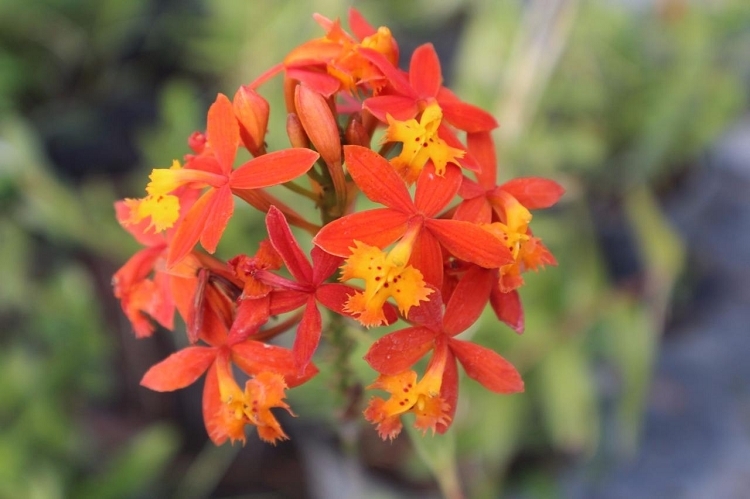 Epidendrum radicans, is a terrestial orchid and grows best in cypress mulch or very humus soil. We enjoy these in Mexico growing near our farm on rocky mountain sides. These will take full sun but enjoy light shade if possible. They are shipped fresh cut to order here in South Florida, where we also enjoy seeing the flowers almost daily and almost year round. We try to ship at least one plant in spike or bud, usually we can send more. We have many of these and are offering a FREE plant when you purchase 4. This helps with the postage on your end. It is best to plant 5 in a 6" pot for a nice show. 3 will go nicely in a 4" . Aerial rooted cuttings are cut to fit a 10" box and we refund any excess calculated postage via paypal refund, or include extra plant(s). At least 5 of these plants will ship at 1 lb. We also have these in Red and purple which are slightly higher in price. We refund excess calculated postage. We ship plants Mondays, Tuesdays and some Saturdays weather permitting along the way. Other items not affected by weather are same day if received before 10AM and next day otherwise. We can also ship this plant in 6" pots which contain multiple plants. We prefer to ship bare root to California, Hawaii and Arizona. We free ship very little prefering to give a good price and not add this in on the cost of the item. We can combine ship with our regular extensive listing on our web site. So far so good! All arrived in great condition and look good! Will take some time before seeing flowers, but I feel all will be well. First time ordering from your company.